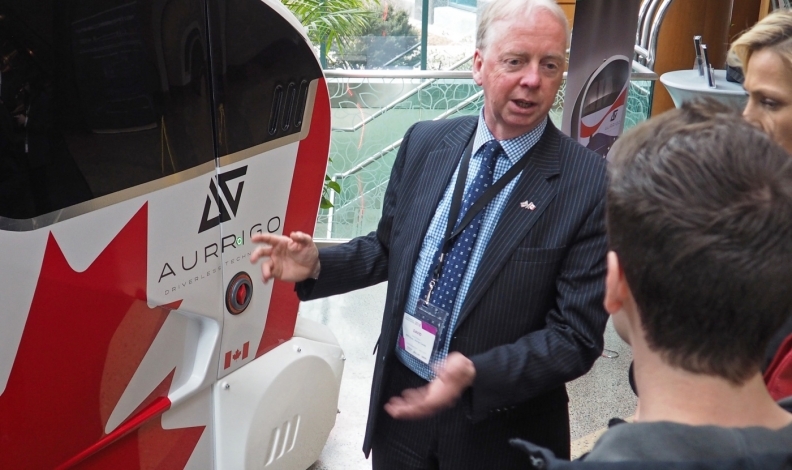 Aurrigo CEO David Keene shows the PodZero transporter at the Autonomous Vehicle Summit in Ottawa. OTTAWA — British autonomous vehicle manufacturer Aurrigo is opening an Ottawa office as it seeks sales of its self-driving, low-speed transporters in the Canadian market. Aurrigo, a division of Coventry-based Tier 1 auto supplier RMD Group, aims its four-seat PodZero at school campuses, airports and similar "first- and last-mile" uses. The Ottawa location joins offices in Houston and Australia as the company attempts to build on what chief executive David Keene describes as "significant global interest" in the electric-powered pods. Aurrigo announced its expansion into Canada at the annual Autonomous Vehicle Summit in Ottawa on Tuesday. City officials and technology companies are working to establish the Canadian capital as a leading centre for AV development. Aurrigo has built 15 PodZeroes after earlier developing the LUTZ (Low-carbon Urban Transport Zone) Pathfinder prototype as part of a U.K. consortium. "We expect to have 60 [PodZeroes] on the road by the end of the year," Keene, a former Rover executive, said in an interview.